Last revised 3 May 2009. 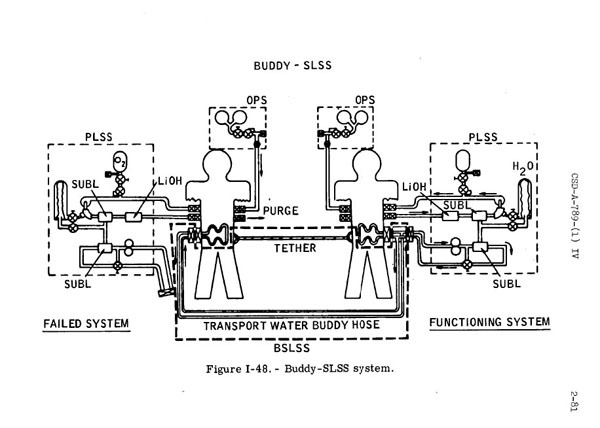 Jack Schmitt, from a conversation during the Apollo 17 ALSJ mission review: "It rings a very faint bell that we had something called a Buddy SLSS; and the fact that neither of us remembers much about it shows how much we felt we'd need it!" "Frankly, we never trained on that emergency at all. We knew we had it (meaning the BSLSS) and looked at the equipment, but that was the extent of it." Similarly, the Apollo 13 crew planned to land at Fra Mauro, at the same location where Apollo 14 later landed. During the second EVA, they intended to make a traverse to the rim of Cone Crater, a trip that would take them about 1250 meters from the LM. Because of the need to make their way around craters along the route, a more realistic travel distance was about 1400 meters. At 3 km/hr, at the end of a 1.4-km, 28-minute trip back to the LM, they would have had roughly 11 minutes of time remaining on one of the OPSs and could use the second OPS for ingress. In the weeks before Apollo 12, NASA began to take a closer look at the needs of the Apollo 16-20 crews, who would have the Lunar Roving vehicle and would make drives of up to 8 kilometers. In the event that one of the two PLSSs failed completely, the crew could be faced with a drive of up to an hour back to the LM. Use of the two OPSs succesively in high-flow would get them back to the LM with only about 18 minutes remaining on the second OPS. In principle, that would have allowed an Emergency LM Ingress, but with an uncomfortably thin margin. At a 10 October 1969 meeting of the Manned Space Flight Management Council, "Major Milestones were reached for extending astronauts' staytime on the moon and increasing their mobility for the Apollo 16 - 20 missions. 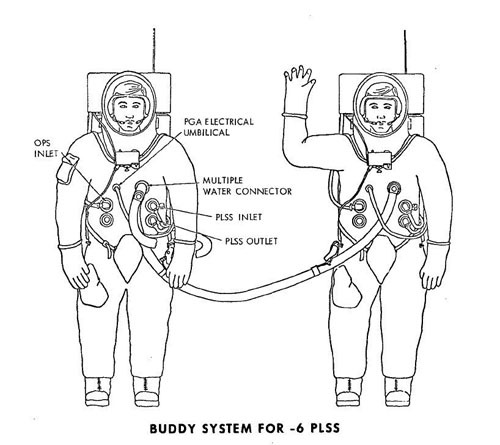 Modification of the A7L spacesuit incorporating improved waist mobility were authorized, and letter contract authority for the portable life support system/secondary life support system was approved." Increased waist mobility would allow the astronauts to sit on the Rover and would improve running speed. Increased capacity of the PLSSs would allow 8-hour EVA. We have not been able to locate details of an advanced Secondary Life Support System (SSSS) that was under consideration. However, in a 3 November 1969 letter to James McDivitt, then Manager of the Apollo Spacecraft Program, "Christopher C. Kraft, Jr., MSC Director of Flight Operations, suggested that an in-house review re-evaluate the Apollo secondary life support system, because of its complexity and cost of development, and, at the same time re-examine the possibilities of an expanded oxygen purge system using identical concepts." 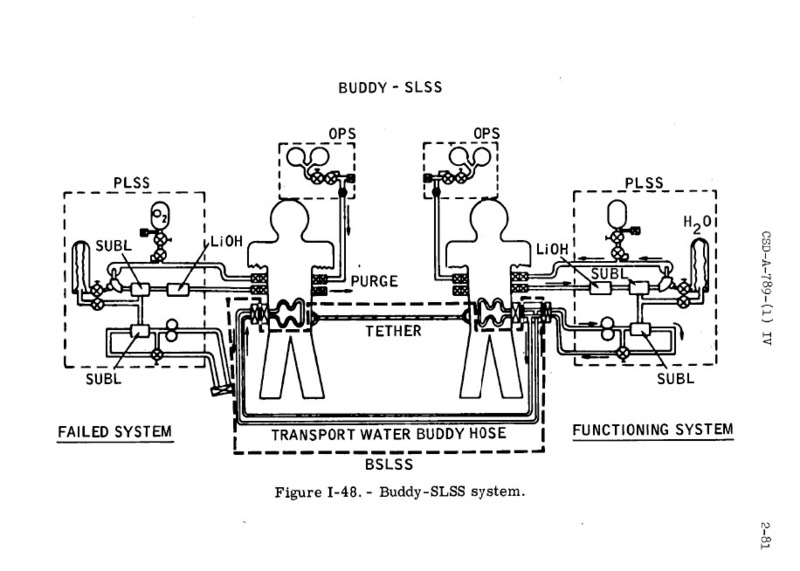 The Buddy Secondary Life Supoort System was an effective, relatively inexpensive result of the re-evaluation. Scott - "Well, I think (the BSLSS was) probably an evolution from the SCUBA (Self-Contained Underwater Breathing Apparatus) work we did. As you probably know, everybody was trained in scuba. We went to the Navy's Underwater Demolition School and got all that training, with two tanks, not one tank. So we stayed down a long time, which was a lot of fun. Another nice element of what we were taught." "In SCUBA, you are trained that, if you lose your mouthpiece or oxygen, you breath on your buddy's oxygen. So I would say, off the top of my head, that when we get into on-the-Moon exercises, you think about the buddy system and you think about breathing underwater, and you think, 'Gee, if my oxygen goes out, I'll tap into my buddy's oxygen. Because that's already demonstrated and that works out very well. That may have been the evolution. I thought it was obviously a good idea. Before we were assigned the Rover, we had the longer duration, seven-hour PLSS, so we were going to be able to go much further than 14 (who had a four-hour PLSS capability, with margins), even if we only had a MET, which would mean that the buddy system would be even more important. And we practiced it, and I think it was a great idea." The fact that, twenty years after Apollo, Dave mistakenly thought the BLSS was used to share oxygen, rather than cooling water, is irrelevant. The principle is the same. f. A thermal pouch for stowage of the assembly on the PLSS during EVA and in the LM cabin during non-EVA periods. 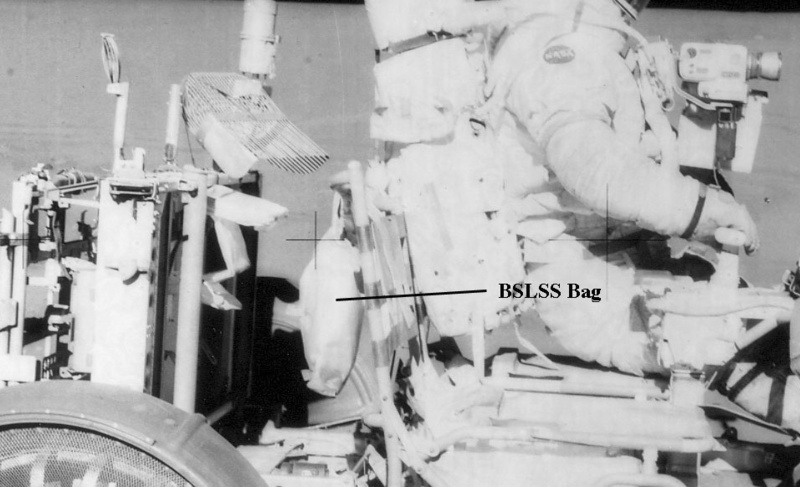 During the Apollo 14 EVAs, the BSLSS bag was stowed on the Modular Equipment Transporter (MET) and, during the Apollo 15-17 traverses, it was hung from the back of one of the Rover seats. BSLSS pages from Charlie Duke's flown EVA-1 Cuff Checklist. Images courtesy Ron Shelton, South Carolina State Museum. 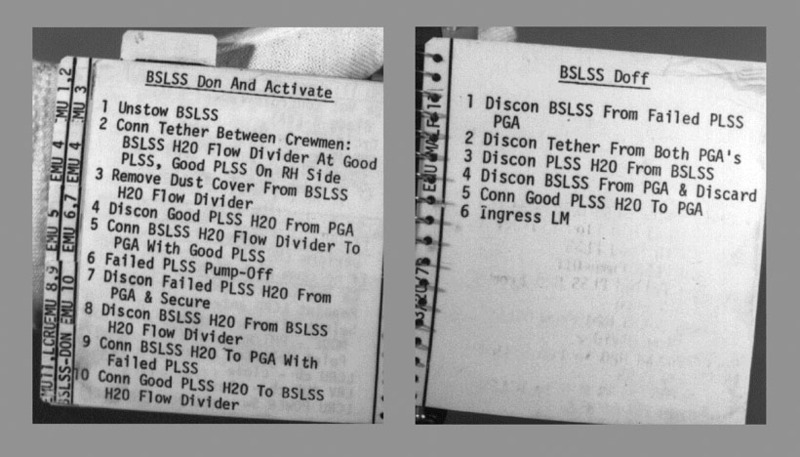 The procedures given in the Apollo 14, 15, and 17 cuff checklists are nearly identical to these, differing only in that the words "Good PLSS on RH side" in Item 2 on the first of the two pages does not appear in the Apollo 14 version. Clearly, use of the BSLSS required that the astronaut with the good PLSS be on his buddy's right.